Do you ever come across bunches of these at antique and thrift shops? Ever wonder what you could do with them? I have, so I’ve bought a few here and there (they’re usually $1 or less) and have finally come up with an idea to display them in a pretty way. 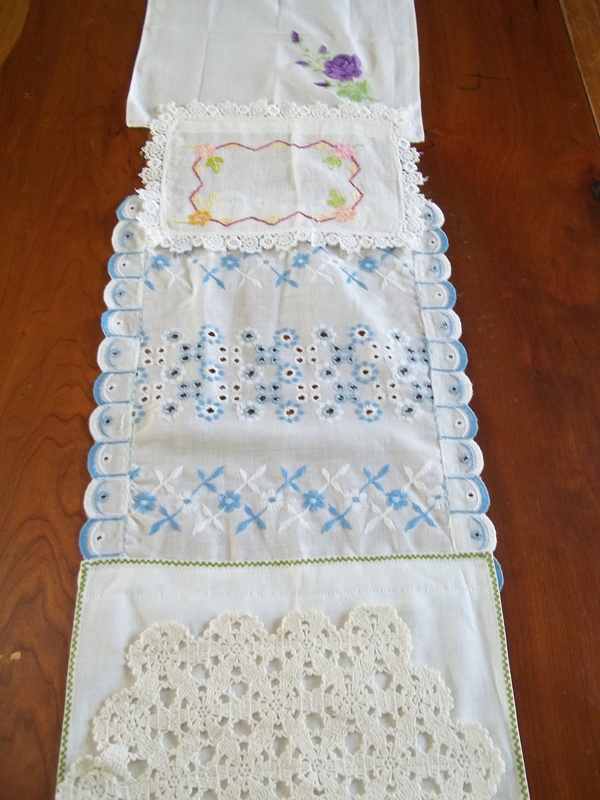 A table runner made exclusively of vintage hankies and doilies. Perfect for your Easter table or just for spring. This was incredibly simple to make and probably took me 30 minutes to pull together. It only takes a minimal of sewing skills too. 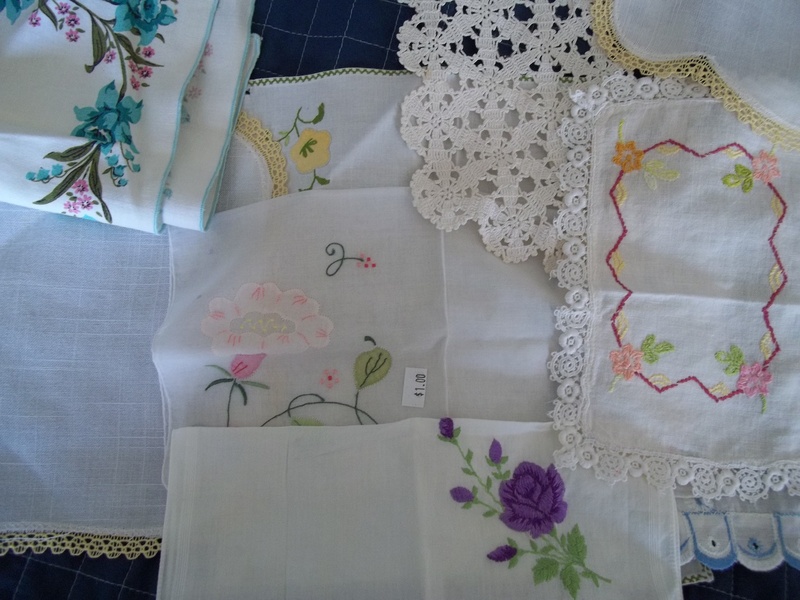 First, I chose which hankies or doilies I wanted to use. To be honest with you, I didn’t use several pretty ones because they had too much staining on them. Once I picked some out, I lined them up in the order that I wanted them displayed. Notice that I overlapped lots of the edges on purpose. 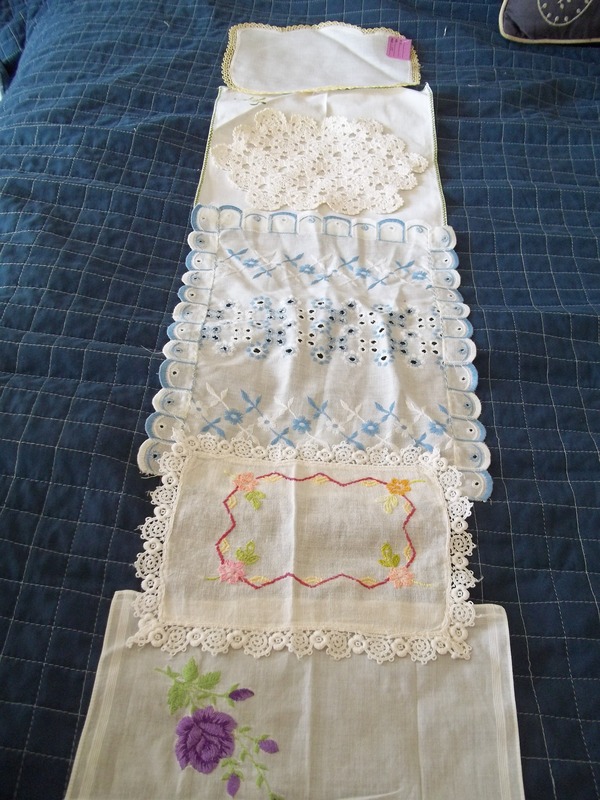 Many of these items are a very thin material, but have such pretty and feminine detailing. Then I cranked up my sewing machine. Basically I started at one end and pinned two together where I wanted them to join. 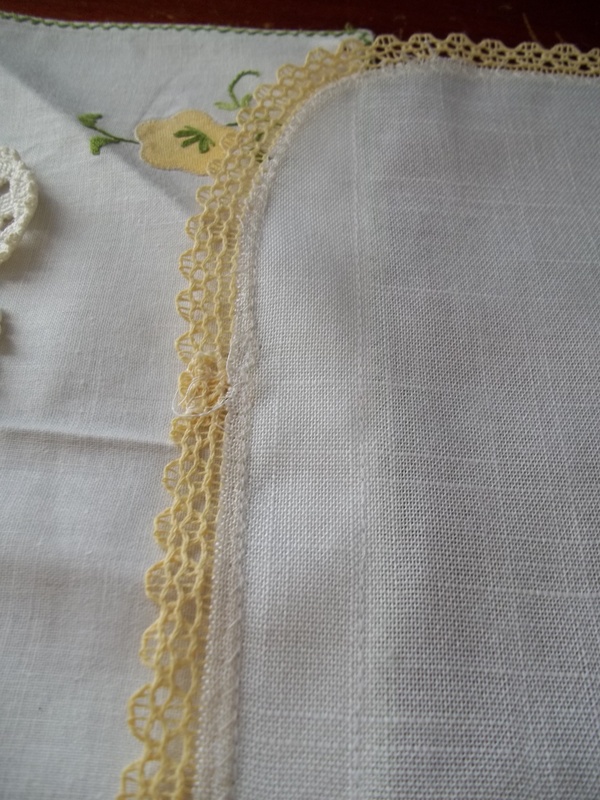 I chose white thread so it wouldn’t show too much and sewed several straight lines to connect them. Then I would move on to the next one, join that, and moved down the line until everything was sewn together. 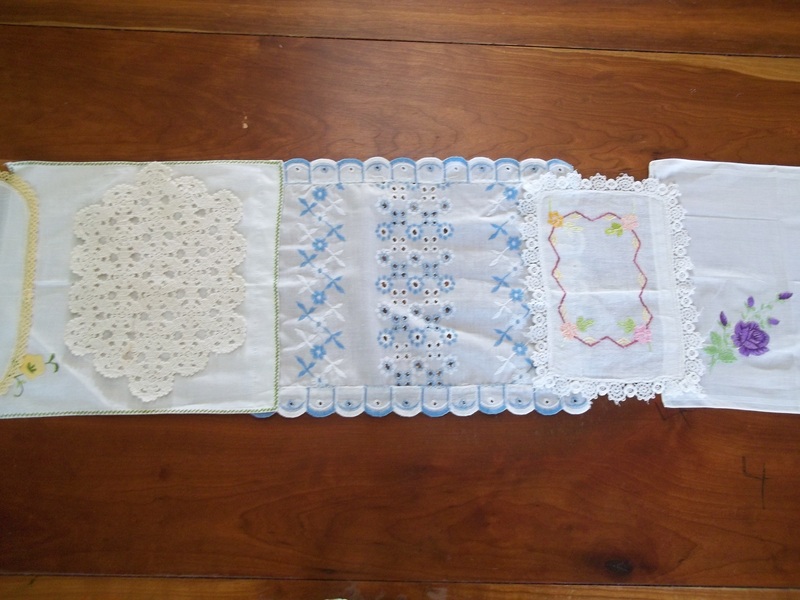 I also want to note that I placed one doily entirely on top of a larger hankie that I felt had a lot of blank space. I sewed a few lines to attach this and you really can’t see the stitches at all. 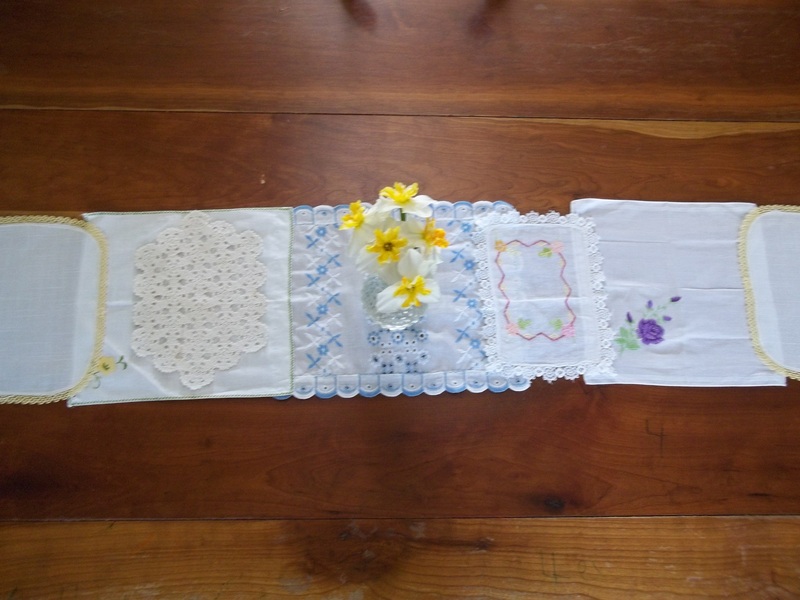 I laid this on my much-loved kitchen table and topped it off with a vase of frilly daffodils. Love it! 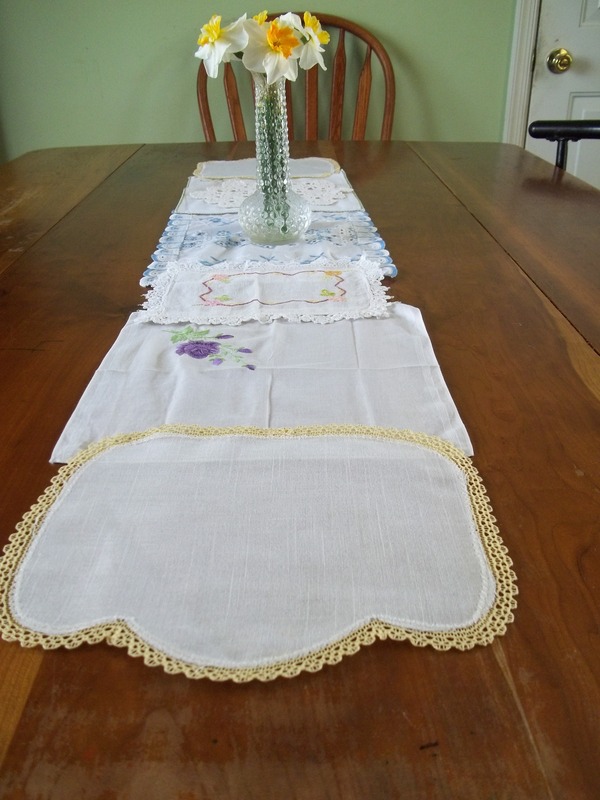 PS-These hankies always remind me of my sweet Mom-Mom, who passed away last fall. She always had a hankie tucked up her sleeve, sometimes rolling the end of her sleeve to hold it in place. We would sort of tease her for doing this, but it is a fun memory of her.